Every weekend of the International Home and Housewares Show, my daughter Kristina and I are honored by our friends Dan Kulp and Rachel Litner of Rachel Litner Associcates to be invited to their dinners at trendy and amazing Chicago restaurants. 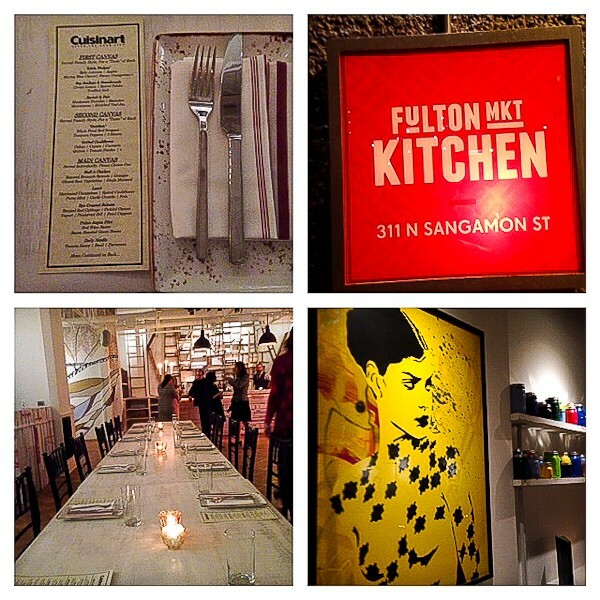 This year the gathering with Cuisinart took place at a very unique restaurant, Fulton Market Kitchen. 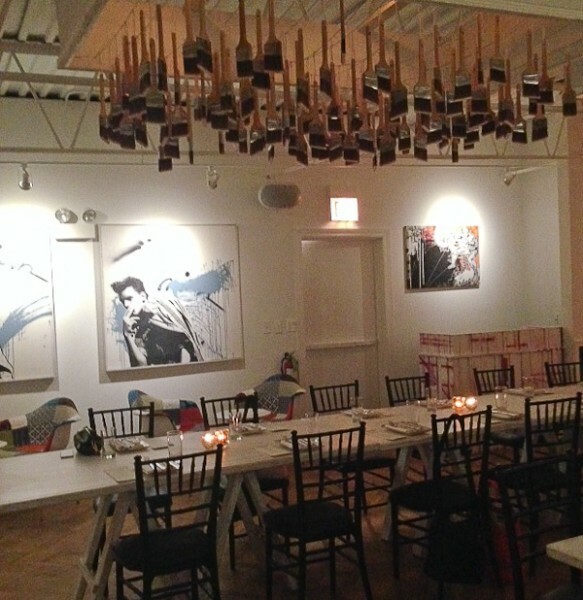 This unique dining experience combines American cuisine with street art, graffiti, and pop art. 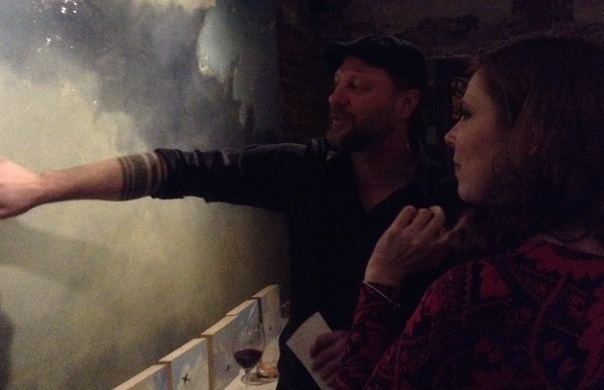 One can soak in the world of artists with a brush coupled with artists in the kitchen. 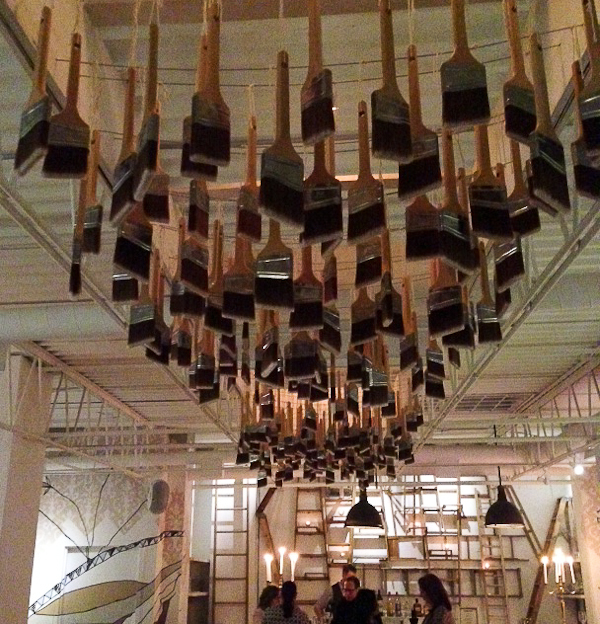 No need for a chandelier; simply hang some brushes! 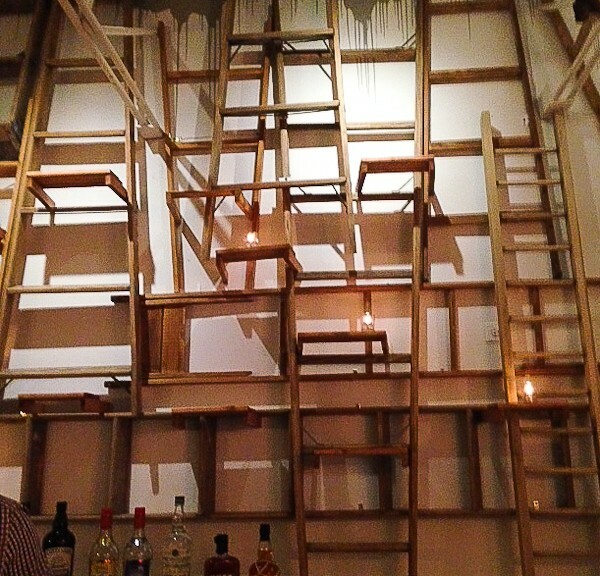 Behind the bar area was a collection of ladders. Art was displayed on every wall. 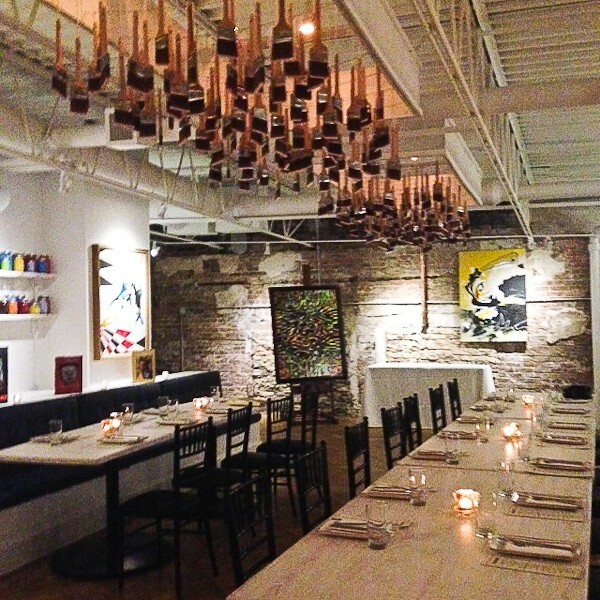 The art collection in the restaurant (more downstairs) rotates several times a year to introduce new local artists and at the same time revitalizes the dining enjoyment. Kristina especially loved this work by artist Franklin Riley. After chatting with other guests and enjoying the delicious appetizers, we all sat down to dinner anticipating more works of art on the plate as well. Our “First Canvas” consisted of three dishes “Served Family Style, For a Taste of Each”. 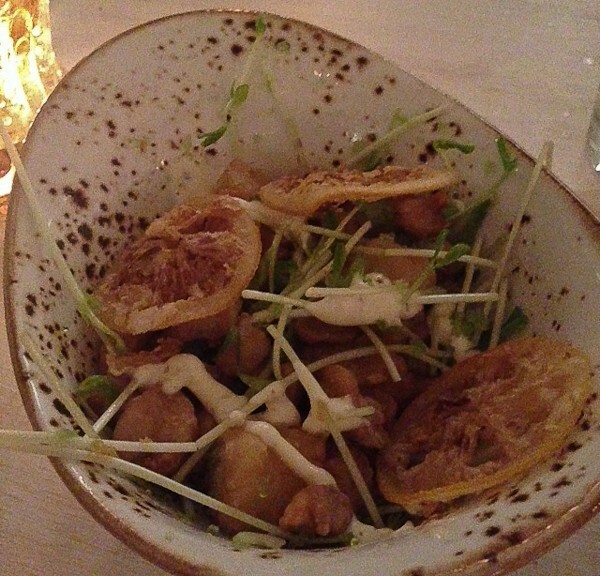 Bay Scallops and Sweetbreads with Crispy Lemon, Spiced Tobiko, and Truffled Aioli. 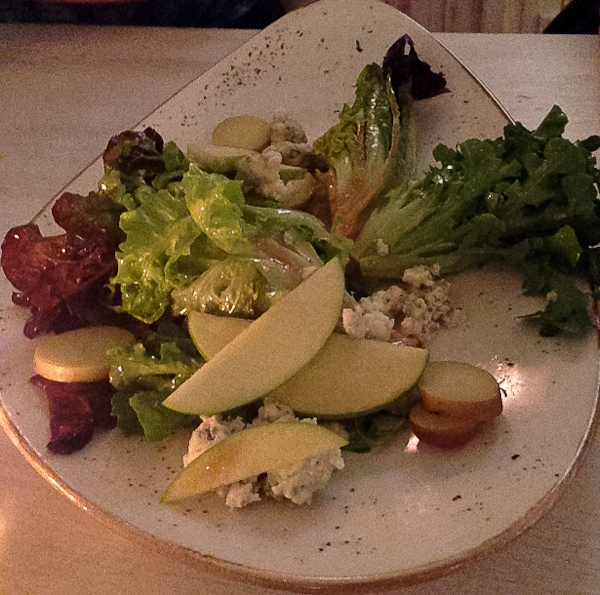 Little Wedges of Baby Lettuces, Apples, Maytag Bleu Cheese, and Sherry Vinaigrette. 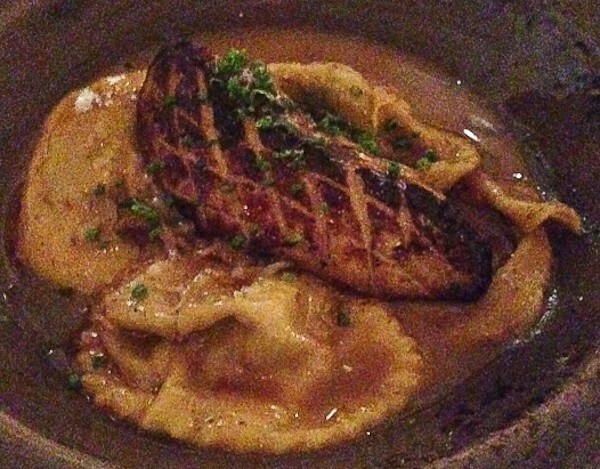 Ravioli and Foie with Mushroom Duxelles, Maitakes, Mascarpone, and Enriched Veal Jus. 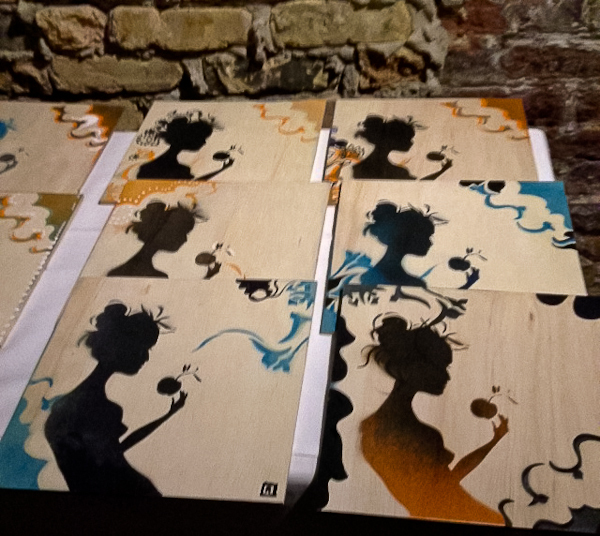 The “Second Canvas” was also served Family Style. 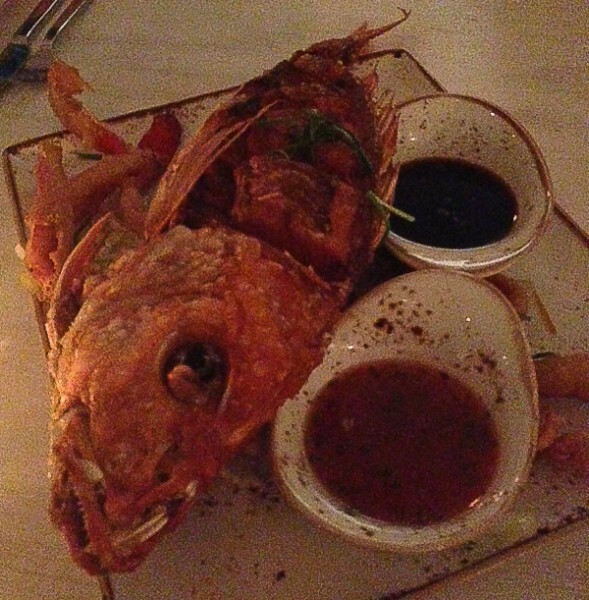 This was called “Goldfish” but was whole fried red snapper with tempura peppers and three sauces. 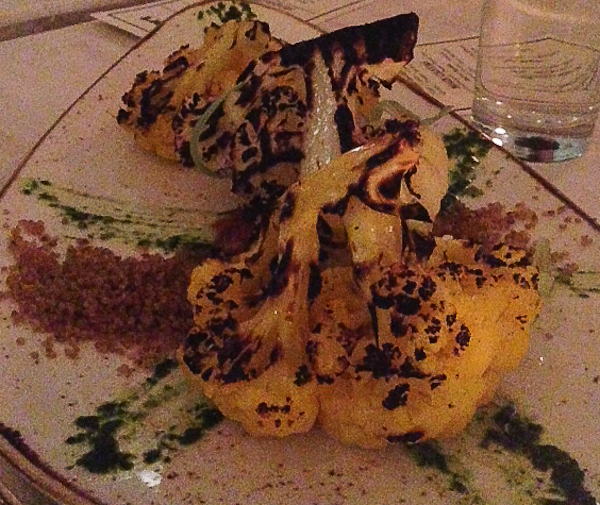 Grilled cauliflower with celery, capers, currants, quinoa, and tomato fondue. The “Main Canvas” was served individually and we were given a choice of chicken, lamb, salmon, prime angus, or noodle. Kristina selected the Half Chicken with Roasted Brussels Sprouts, Oranges, Glazed Root Vegetables, and a Grain Mustard. 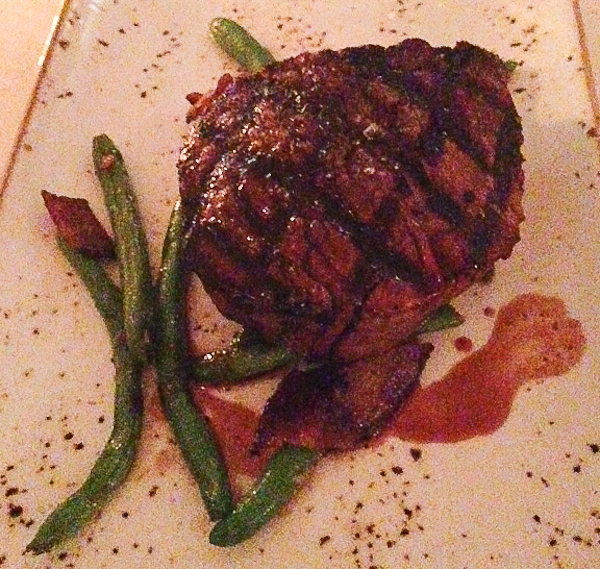 I opted for the Prime Angus Filet with a Red Wine Sauce and Bacon Roasted Green Beans. 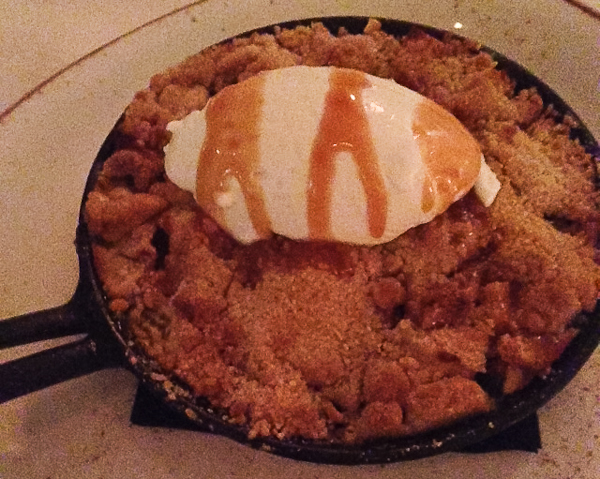 Dessert was an Apple Crisp with a Goat Cheese Mousse and Caramel; and Chocolate Pot de Creme with Sea Salt. 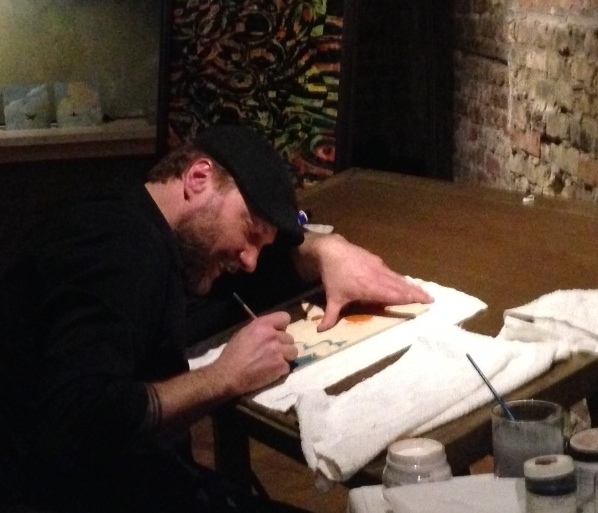 During our meal, and unbeknownst to the guests, artist Franklin Riley was painting each of us a work of art to take home. On each canvas was a female figure, but Franklin embellished each with a different flourish to make each one unique. We were all thrilled! And oddly enough, the facial profile of the woman looked like my youngest, Kara! We all left full and happy with a work of original art to frame when we returned home. But we were not done having fun with Dan and Rachel quite yet. The next evening they invited us to cocktails with Joseph Joseph on the 95th Floor of the Hancock Building with a view to take your breath away. Do you know why this fabulous company with the unique kitchen items is called Joseph Joseph? Because it was founded by two brothers who are twins! 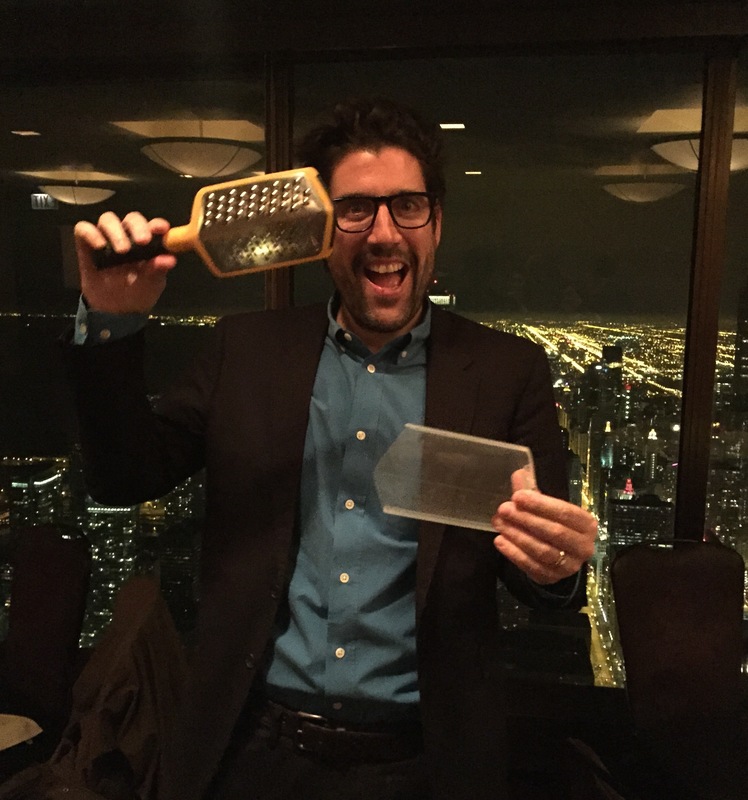 One of the twins gave me their wonderful grater to take home that has a handle to twist and stand up as the cheese is grated. I love it! We loved all their innovative and creative products. Plus it doesn’t hurt that they are the nicest guys! We had a blast. Thank you Rachel, Dan, Cuisinart, and Joseph Joseph! You always make the Home and Housewares weekend so memorable! 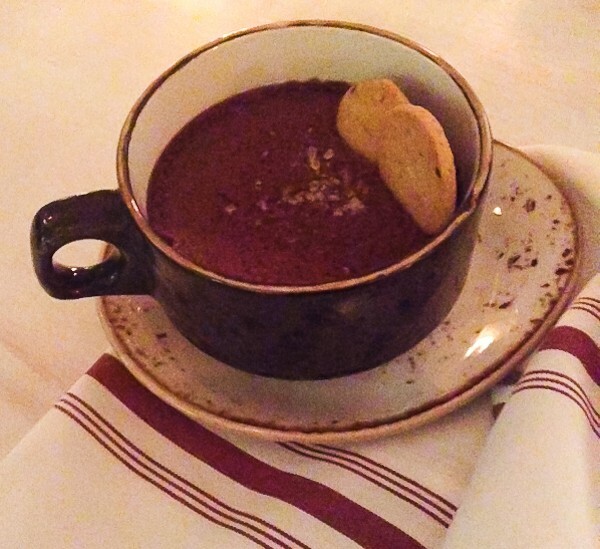 Looks delicious and very inovative ! I bought some Joseph Joseph kitchen items last year and they quickly become my go-to cooking utensils. Perfect combo – inspiring art and tantalizing food, two things I love to linger over and enjoy!